Still in Indiana. Tuesday afternoon three friends, Suma, Anne and Amy, who I’ve known since elementary school, junior high, and high school, respectively, converged at my parents’ house. Had a great time over sushi dinner out (They have a sushi restaurant in Terre Haute now!). After we returned to the house and played a game of Settlers of Catan under the guidance of my brother-in-law, Tom, who just spent his weekend at Gen-Con, the nation’s largest game convention, that happens annually in Indianapolis. Back in Tallahassee, among those of us into board games, the favorites are often Tom’s recommendations. Last night he gave us a little history of our current generation of board games. Apparently in about 1995 some folks in Germany looked at the state of games and realized that while video games were popular, they were socially isolating, and that most board games eliminated players as they progressed, and were overly dependent on single strategies or luck, so they set out to improve game play. The resulting games are more interactive, less dependent on luck, they have multiple strategies that you can use to win, and everyone remains involved until a winner emerges. Amy, Anne and I (and hopefully Tom) had a great time last playing Settlers, which Paul and I had already ordered online for our friends in Tally. 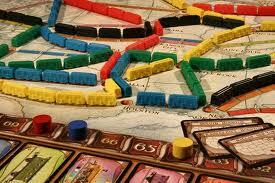 Earlier in the week the family also played Ticket To Ride—Germany, which is a variation on the standard Ticket to Ride (U.S.) we’ve been playing. Both are great games and highly recommended, but you can’t get them at Wal-Mart. Tom suggests thoughthammer.com, and fairplaygames.com. 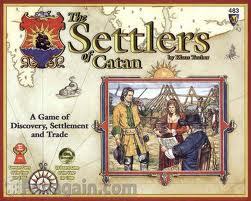 you know that settlers is scarily popular with lindy hoppers all over the world?